Our LED Decorative line is designed for theaters, Signs, Carnivals and Casino’s. What makes our full line of LED decorative LED bulbs is that they mimic a traditional incandescent but offering the benefits of an LED lighting source. It’s important to us that the bulb mimics the look of a filament, the color of a filament but at the same time using 10-20% of the electricity, last over 10 times longer and be more durable by using solid state lighting technologies. They also emit little to no heat which in turn does not burn out the sockets that are connecting these light sources which is a big reason for failure rates in signage, chasing systems, theater marquees and casino signage. GBL LED’s S14 LED bulb (also known as an 11S14 bulb) has been utilized to save hundreds of thousands of dollars in maintenance, bulb replacements, electricity costs while maintaining the authentic looks in hundreds of locations around the world, including a number of amusement parks, some notable theaters, including the Prince of Whales theater in Toronto, Shea’s Theater in Buffalo, New York, the installation at Riverside hotel in Laughlin Nevada, a clock tower and sky spiral in downtown Manhattan New York and a number of Casino Marquees and Architectural outlines in Canada and across the United States. GBL S14 LED Lamp uses 1.4 Watts of electricity in comparison to a standard 11 Watt S14 incandescent, uses solid state technology compared to delicate filaments that many times break before their installed and we also offer a 3 year warranty, unheard of in the incandescent and cold cathode lighting arena. GBLs S14 LED bulb also can be made in specific colours that are 10 times more crisp in color quality than any other light source available in the world today. Another of our popular LED lamp in the Casino Signage and theater Marquee world includes the S11 LED Lamp. We manufacture a few varieties of the S11 in either a clear globe or a White Globe with either a E26 medium base socket, a E12 candelabra base or a E17 intermediate base. E14 and E16 are also available for European installation. Our intermediate base S11 Lamp has been used in a number of high profile Casino signs and channel lettering signs all over the US, Canada and Mexico. On request, we produce and pack these bulbs in wholesale packaging so that they can be easily taken out of the packaging while on rented lifts, in turn bringing your labor costs down. 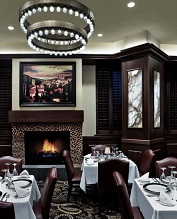 At GBL, we’ve also made some custom LED bulbs for various installations, of course minimum order quantities are needed to be able to offer these, including the following installation for a prominent steak house in Atlanta, Georgia. At the same time we’ve shipped thousands of LED G8 lamps to Las Vegas Nevada for a number of LED lamp retrofits along the most famous lit streets in the world, Las Vegas Boulevard. It’s important to us that our customers receive a product that meets or exceeds there highest standards. 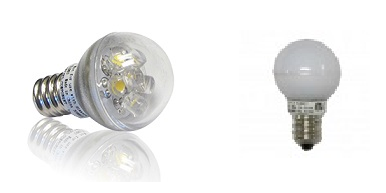 We offer our G8 LED bulb with its standard small globe in both a clear globe or frosted LED Globe version. The clear version mimics a filament while the frosted globe LED version has an even globe light output, more attractive visual appeal then any incandescent available in the lighting world. We also stock a number of signage sockets to make installation easy and less time consuming with our LED bulbs, these are recessed and outdoor rated, contact us for all the details. Also manufactured for standard North American voltage fluctuations of 90-130V AC, this 6S6 LED bulb only uses 1 Watt in comparison to the 6 Watt S6 incandescent dinosaur counterpart. Available in 2700K warm white, amber, Warm White 3000K, daylight 4500K, and 6000K Cool White light. With an MOQ met red, green and blue are also available. GBLs 6S6 bulb is stocked outside Vancouver in Coquitlam Canada. Also used for LED signage in theaters and decorative lighting applications. We have worked with a number ofworldwide companies to produce custom LED Lamps that work with their specified lighting needs. This is our E12-EA 6 LED, uses 1 eat and can be made with a range of housing colours, in this picture it's shown with a black housing. Can be manufactured with a E11, E12 or E14 base. Seen in installations at the Taj in Atlantic City, New Jersey, various locations in Las Vegas Nevada and a number of installations in Quebec Canada. Please understand, 90% of our custom LED bulbs and custom LED Fixtures will not be found in our marketing materials as they have exclusivity agreements in place, if this is something your company needs, contact us, as we have our own LED lighting factory, Plastics and tooling department as well as in house product designer. 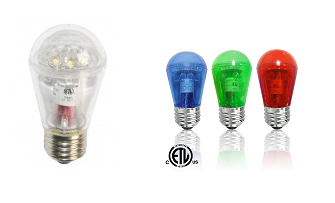 Manufactured to resemble a filament, GBLs G25 LED bulb is an easy decision replacement for a G25 25 watt incandescent. This glass bulb can also be made in a Tivoli G25 style theater lamp (GBLs DNA Bulb) or our a standard "LED" filament look version. Our price point and Lighting look for our LED G25 lamp cannot be beat. Manufactured at our own LED lighting factory that focusses on making Casino LED Bulbs, LED lamps for chasing systems, theater signs and carnival ride lighting. Contact us for other LED G bulb options, including our LED G16, G25 and and G40 that were inspired and originally designed for Las Vegas world renowned signage. Our G16.5 LED lamp replacement has been used over the years in a range of incandescent replacement projects, including the traditional carousel pictured beside the lamp done in South America. The Carousel owners wanted a very warm tone and we came through by using a custom 2400K temperature LED, producing a very warm tone that the customer was excited about. Drawing only 1.5Watts this LED bulb replaces a 15W standard G16 1/2 bulb. When installed the lamp resembles traditional lighting by using our patented LED bouquet arrangement. The same bulb is also available with a larger globe on request, contact us for your specific lamp needs. Our largest globe available, GBLs G40 LED Globe bulb has a diameter of 4-3/4", includes an E26 medium base E27 available for Europe, has a large glass globe and a PC Base that separates the two. Also designed to mimic a filament without the incandescent disadvantages this bulb crushes the low lamp life from a G40 incandescent. Installed in numerous Hotel Lobbies as overhead Hotel Signage lighting, manufactured with a 2700K LED Chip (other colors available) to emit the glow of more traditional lights. We offer a few varieties of high grade commercial string lighting popular for restaurants, gazebos, city paths & walkways. We offer 48 and 100ft lengths in suspended or non suspended versions. Popularly used with our clear and frosted S11 LED and our S14 LED bulb. Top of the line string lights that can handle North American weather.